Rustic Table with Breadboard Ends. We just finished 2 tables for our client in MD. “Shannon” and “Gauss”. Shannon is blonde maple: Gauss is made with reclaimed pine bowling lane wood. The top is ebony, and the bottom unit of apron and legs are a deep brown: In the pictures you can see craftsman Adam, here’s what he writes about creating these tables. Gauss, a yellow pine table, was once part of a bowling lane in the Adirondak mountains of upstate New York. I selected an 8′ length, reinforced the underside with steel and then sanded the surfaces. Given the weight of the table I designed a leg frame with cross and diagonal bracing to withstand all forces. The tabletop was stained with ebony and the legs received a brown walnut color. I applied 3 coats of a dull rub finish all around, hand applied and polished in a traditional New England fashion. Shannon was built from locally harvested maple. I buy all my domestic hardwoods from a mill a few miles from my parents farm in the upper Catskill mountains of upstate. My brother is a blacksmith, a craftsman as well, and I commissioned him to make a set of steel braces which I used to reinforce the slab legs. This table has very smooth, clean lines and to maintain that the braces are completely hidden within the wood. I left the natural wood color and hand coated the table with semi-gloss polyurethane. 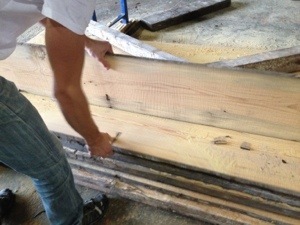 Right now we’re working on a table for Sam and Jade using reclaimed yellow Pine. Pics will be uploaded today and during the week. Stay tuned. Picking the yellow pine from the salvage yard. Apron pieces after sanding and planing. Leg pieces: Tabletop and Bench: Test fitting the boards: Almost Finished Tabletop. Bench top Finished Product. I’m not sure if you can see in these pics, but I love the “burnt like” quality of the wood on the bench. It looks like burnt honey. Very great color.